Flood control was underway in the South Bay, and Santa Cruz Mountains residents were bracing for possible mudslides as the first substantial rain of the season approached Thursday. At Silver Creek in San Jose, crews from water districts and other agencies have been digging along the river banks to control rising waters, part of a months-long, citywide project to prevent flooding. Across town, in the Willow Glen neighborhood, city workers were busy clearing storm drains. And Santa Clara County issued a release Thursday warning residents near the Loma Fire in the Santa Cruz Mountains to prepare for flooding. Rains are expected to hit the North Bay early Friday morning and make their way down to the South Bay by late morning, according to forecasts. Rainfall is expected on and off through the weekend, with showers lingering into Monday morning. Flood control is underway in the South Bay as the first substantial rain of the season approaches. Damian Trujillo reports. Cal Fire specialists surveyed 20 properties, covering about a third of the Loma Fire zone. If the expected rainfall becomes a downpour, officials say several homes could be in the path of a mudslide. "It could be several feet, I don’t know how deep," said Peter Cafferata, Cal Fire watershed manager. "But it could take out a house or an outbuilding. We won’t be able to protect them, but we can warn people to get out in time." Homeowners like Carmine Scelzi, who’s lived in the area for 16 years, says he still sees hot spots and can only hope that the pile of ash covering the hillsides doesn’t slide. "The last time I went up the hill, it was 10 inches deep on the road. Don’t let it hit the watershed," he said. Survey teams need two more days to complete their review. But the first storm isn’t waiting for them to place seed, straw and sandbags to prevent slides. "Be prepared to leave on very short notice," Cal Fire Division Chief Ed Orre said. "Stock up on food in case you are trapped behind a bridge that fails." Meanwhile, in San Jose, the Silver Creek project has been ongoing for a few months, and it's welcome news for residents who recall the rising waters several years ago. "Before, in 1992, it was full," Jose Garcia, of San Jose, said about the creek. "It’s much better like this." 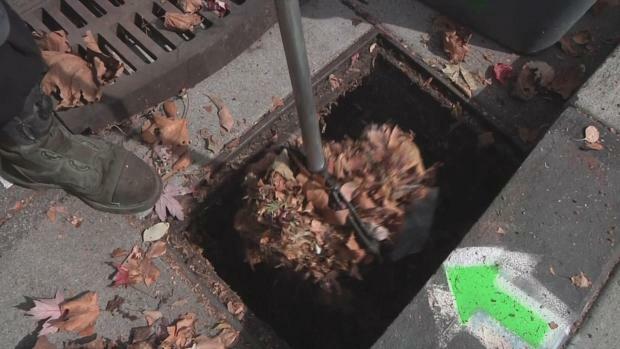 In Willow Glen, there were four crews unclogging and cleaning drains of brush, leaves, dirt and other debris that builds up during the dry seasons. Since August, they have cleared nearly 13,000 storm drains throughout the city. "It creates that plug in storm mains, storm laterals, and allows water and buildup in the street, which is a hazard to vehicles, pedestrians and bicyclists," maintenance worker Richard Look said. Crews still have more than half of the city’s 31,000 catch basins to clear. They say residents can help by clearing debris around their own homes and drains, something the Willow Glen community says it already does. "We’re all very good neighbors," Honor Spitz said. "We’ll have leaves, and we take turns just spontaneously going out and clearing the storm drain before leaves get into the storm drain." Crews say preventative maintenance will make the rains easier to deal with once they arrive. The Department of Roads and Airports will be monitoring unincorporated county roads. The South County Fire District will be monitoring roads and conditions and coordinating with law enforcement. Santa Clara County Sheriff’s deputies will be in the field and responding to 911 calls as needed. The Santa Clara Valley Water District will be monitoring reservoirs. Santa Clara County Parks and Open Space Authority representatives will be in the field, monitoring and providing information to the coordinating agencies. Santa Clara County Office of Emergency Services is coordinating with the state. Have a flashlight ready with fresh batteries. Clean out rain gutters, culverts, and streamways. Don’t drive through standing water. Stay away from downed powerlines and trees. Protect outdoor items from wind and rain. For information on preparing for a winter storm, visit the American Red Cross website.